Please come and join us at our Annual General Meeting and open Forum event for a day filled with the sharing and exchanging of ideas, knowledge and discoveries, the exploration of opportunities, and inspiration for new initiatives. Please see the attached flyer (pdf – 66 kb) and jpg (206 kb) for further information. There will be a meeting of the Soteria Derbyshire group this coming Saturday, 20th April, at QMH, Ashgate Road, Chesterfield, at 11.30am. 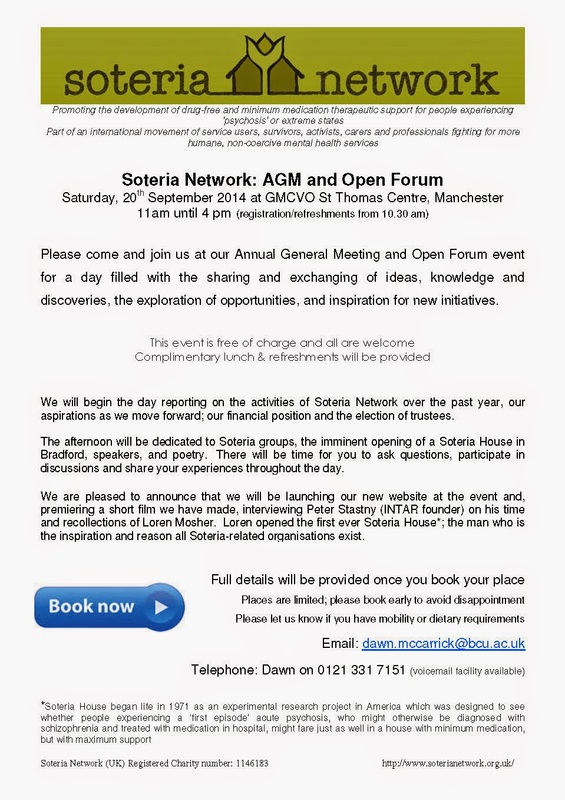 The Soteria Network AGM will take place on 14th April 2012 between 12pm and 1.15pm and will be followed by a discussion of future possibilities and projects. The venue for the AGM is: Room 216, Seacole Building, City South (Edgbaston) Campus, Birmingham City University, Westbourne Road, Birmingham B15 3TN.